It’s not just what we put in our soups, it’s what we leave out. None of our mixes contain preservatives, MSG, or added salt. 100% of Cooke Tavern’s electrical needs are supplied by solar energy. And we recycle everything we can striving for 0% waste. 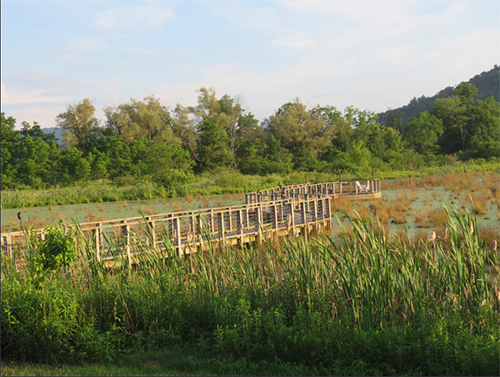 The property includes Muddy Paws Wetlands – 40 acres used for education, club gardens, events and fun for all ages. The Cooke Tavern is a grand 2-story Georgian-style brick property built in 1808 by James Cooke, esq. This Tavern was in operation from 1808 until 1863. Above all, tavern-keepers were expected to provide their patrons with a tempting bill of fare daily — a choice of chowders & soups, fresh meats & fish, and fresh vegetables. Each meal was served along with a bottle of wine, a bowl of punch, or a tankard of ale. When Greg and Mary Kay purchased the property in 1991 they lived the ‘real money pit saga’. They did a complete restoration of the house, outbuildings and property. It didn’t have heating or plumbing but came complete with a two seater outhouse! They named the property after the original owner, James Cooke from Lancaster PA. In 1995, they won the ‘Excellence in Historic Restoration Award’ from the Centre County Historical Society. 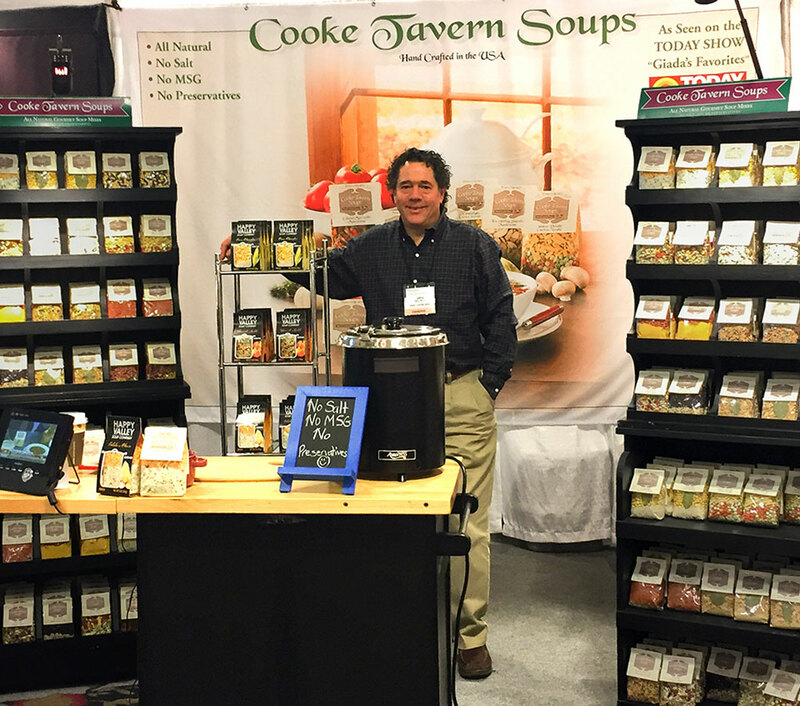 In keeping with Colonial tradition, Cooke Tavern Soups captures the hearth-cooked flavor in all of our soups. 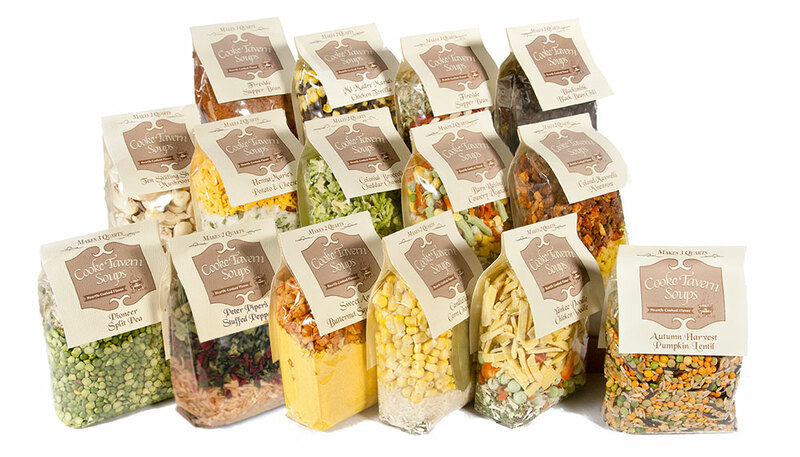 We’ve replicated family recipes with dried ingredients and named them after those who influenced their creation. Designed for busy people who want to serve a great pot of homemade soup without the fuss of starting from scratch. All you add are a few pantry items like broth and maybe a fresh vegetable, and your choice of meat should you so desire. All of the energy needed to run the Cooke Tavern Soup operation is solar powered. Ground loop geothermal HVAC units provide the heating & cooling for our entire manufacturing facility. A 10KW ground mount solar array to use the sun’s rays to provide us with 100% of our energy needs. We also recycle everything we can: cans, bottles, ink cartridges, paper, and all cardboard boxes. We also only use 100% cornstarch packing ‘peanuts’ rather than Styrofoam packing materials so when you receive your order you can easily re-use, recycle and dispose of ‘guilt free’. The Cooke Tavern is situated on 40 acres in Spring Mills PA. When purchased in 1991, the property was a mowed field that was once a wetland that was drained circa 1940 for agricultural use. We named it Muddy Paws Marsh after our wonderful dog “Max” (namesake for Colonel Maxwell’s Minestrone) who loved to play and romp daily in ‘his’ wetlands. Muddy Paws is now a thriving wetland in the Upper Penns Creek Watershed and is enjoyed by many to appreciate and learn about the importance of environmental stewardship. The wetland is continuously being cared for and restored to its natural state. Greg and Mary Kay Williams worked with many conservation associations such as: Clearwater Conservancy, Centre County Conservation District, Ducks Unlimited, Penns Valley Conservation Association (PVCA), the Pennsylvania Department of Environmental Protection and U.S. Fish and Wildlife Services to create, improve upon the restoration of the wetlands. Muddy Paws Marsh Wetlands Education Center is visited by grade schools and is open to the public. It’s an official site of the Penn State Extension Master Gardeners of Centre County program with a wonderful demonstration Pollinator garden surrounding a pond. The wetlands attract many migrating birds and a beautiful stretch along Penns Creek where we invite anglers to fish. It is also host to the annual PVCA FrogFest event.